At 136.6 x 70.6 x 8.6 mm, the Samsung I9300 Galaxy S III is certainly not the most compact smartphone around, but you could hardly expect anything better with a 4.8" screen. In fact, Samsung engineers deserve credit for fitting such a massive display in what's basically a mere 4.5mm wider and just over a centimeter taller than its predecessor. The Samsung Galaxy S III isn't too heavy either - 133g sound more than acceptable given its size and, while it will certainly be felt in your pocket, it is by no means a burden. The design of the Samsung I9300 Galaxy S III is one of the most controversial aspects of the new Samsung flagship. Built entirely of glossy plastic, the Galaxy S III takes its cue from the Nexus lineup design, rather than the S II. The glossy finish is a questionable choice for lacking the high-end vibe that a smartphone of this caliber deserves. The good news is that the Samsung Hyperglaze coating partly makes up for that, improving both the feel and the handling of the device. Hyperglaze basically means that there's another, see-through layer of plastic on top of the back panel - similar to what we saw on the Meizu MX. This layer helps mask some of the fingerprints and is actually decently grippy. No, we wouldn't call the Galaxy S III ugly. We do feel that claims about it looking no better than Samsung's entry-level phones are an exaggeration. However, we can't shake off the feeling either that the finish does the S III little justice. Some higher quality plastic a la Galaxy S II or even a polycarbonate unibody along the lines of HTC One X or Nokia N9 would have suited a flagship smartphone much better. The good news is that even if the design is far from perfect, few people will actually be looking at it too closely. Who will waste time looking at the back of the I9300, when there is a screen as gorgeous as this up front? 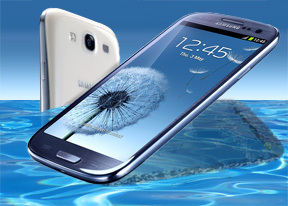 The 4.8" Super AMOLED of HD resolution is where the Samsung I9300 Galaxy S III magic happens. The image quality is every bit as impressive as its specs suggest - tack sharp and with perfectly deep blacks, it's probably the best you can find on the market. The colors are nicely saturated by default, but the display settings menu offers a choice between four different modes, so you can opt for more natural colors as well. We did prefer the livelier dynamic and standard modes, but the natural and movie modes will probably have their fans too. What's important here is that the S III display offers you flexibility that no other screen on the market can give you. Sunlight legibility is splendid too - the HD Super AMOLED isn't the brightest around, but its reflectivity is so low that even when outside in the brightest day, you'll still be able to make out what's on the screen quite clearly. The viewing angles are wide too - there's some color loss when you reach the extremes, but the icons and text remain almost perfectly clear, giving that printed look that we love so much. And here's how the Samsung I9300 Galaxy S III did in our dedicated display test. You can learn more about the testing process over here. Below the display you get the same three keys as on the international version of the Galaxy S II - capacitive Menu and Back buttons and a regular press Home key. The usual extra functionality upon a long press is enabled - the Menu key handles Google search on the device, while the Home key brings up the task switcher. And if you click the home key twice the voice control kicks in. Above the display we have the earpiece, as well as ambient light and proximity sensors. There's also a 2 megapixel front-facing camera for video-calls and a status LED up there. The left side of the Samsung I9300 Galaxy S III features the volume rocker. Unfortunately, all there is on the right is the power key. Once again Samsung is releasing its flagship droid without a dedicated camera key. The top of the Galaxy S III hosts the 3.5mm audio jack. The microUSB port at the bottom is used for both data connections and charging. Not only does it support USB host but it also comes with MHL, enabling HD TV-out connectivity. You'll have to purchase an adapter to use that extra functionality, though. The other thing of interest here is the mouthpiece. The back of the Samsung I9300 Galaxy S III is where the 8 megapixel FullHD-capable camera lens is located. It's flanked by an LED flash and the loudspeaker grille. Removing the paper thin battery cover reveals the microSIM slot, the solid 2100 mAh battery and the microSD card slot.